Is Your Makeup Causing Your Acne and Dull Skin? I tell my teen clients that there is no use applying acne medicine at night if over the counter comedogenic facial skin care and make-up products are going to be applied to their face during the day. Disposing of all traditional make-up products that clogs the pores and causes breakouts and skin care products that contain comedogenic ingredients is a must if you want to clean, clear skin. Why should I use mineral make-up and how is it better than traditional make-up? There are numerous benefits to using mineral makeup over a more traditional makeup. The major difference is the absence of filters such as talc, chemical dyes, binders and chemical preservatives, in addition to its health benefits for the skin. One of the best reasons to wear mineral makeup is that it is non-comedogenic, meaning it doesn’t clog pores and allows your skin to breathe. The best cosmetic you can wear is healthy skin. However, one must be cautious in the mineral make-up they select to put on their skin. Not all mineral make-ups are created equal. Some famous big brand mineral cosmetic lines tout that they are mineral based and healthy for your skin but they also include fillers such as chemical dyes, binders and preservatives. In order to ensure that you are getting a mineral make-up that is truly a skin care make-up, look for a pure pigment mineral make-up line like our H&H Science Mineral Makeup. A pure pigment mineral make-up line like our, H&H Science Brand, does not contain any talc, chemical dyes, binders or synthetic preservatives. It is truly an extension of your skin care regimen. The initial appeal toward traditional makeup for teens was with the coverage it could provide for their breakouts and imperfections. While these products provide coverage, they also prevent the skin from breathing and prolong or worsen any redness, dryness and blemishes, which in turn create the need to wear more. However natural mineral makeup like our H&H Science Mineral Makeup can give similar or even better coverage. Mineral makeup provides a more flawless finish. Mineral makeup is great for active teens who participate in sports and school related activities. It does not clog the pores as it sits on the surface of the skin like fish scales and lets the skin breathe. Traditional makeup tends to either melt or rub off and clogs the pores causing blackheads and breakouts. Mineral make-up looks more natural and will not melt or rub off. Additional advantages include that it doesn’t encourage bacterial growth due to its make hence there isn’t the same risk of contamination, with a bonus of an increased shelf life compared to non-mineral based make-up. Is mineral make-up better for my skin? Research has suggested that mineral makeup is better for your skin. Dr. Helen Torok, board certified dermatologist and medical director at Trillium Creek Dermatology, recommends the H&H Science Brand of pure pigment mineral make-up to all of her teen patients. The unique combination of mica, zinc oxide, iron oxides and titanium dioxide has anti-inflammatory properties which are great for those with problematic skin such as acne, redness or dry skin. This kind of make-up has a calming effect on the skin. The combination of titanium dioxide and zinc oxide in the H&H Science Mineral Makeup offer protection from the sun which is another added benefit. Do I have to apply mineral make-up differently to traditional make-up? Absolutely! Mineral makeup is very different than traditional makeup and so needs to be applied using a different technique. Our H&H Science Brand of mineral make-up brushes are the perfect companion to our H&H Science Pure Pigment Mineral Makeup. We will recommend the ideal make-up brushes for your skin type and the type of coverage you desire. The first point to make is when applying mineral makeup, is that a very small amount goes a long way. The second point to make is in regards to application technique. When applying traditional make-up, you use brush-like strokes to apply. To apply pressed mineral foundations, select the right brush for the amount of coverage you desire, then brush and swirl around to pick up the powder. Apply all over your face using a buffing, swirling motion. Lightly tap the product onto the skin. Pay special attention to the nose, forehead and other areas you may need extra shine coverage. How Do I Know What Type of Mineral Foundation is Best for My Teen Skin? We have created our very own H&H Science Mineral Foundation Guide that takes your skin type into consideration as well as the type of coverage that you prefer. So, follow the guide below to get your perfect match! 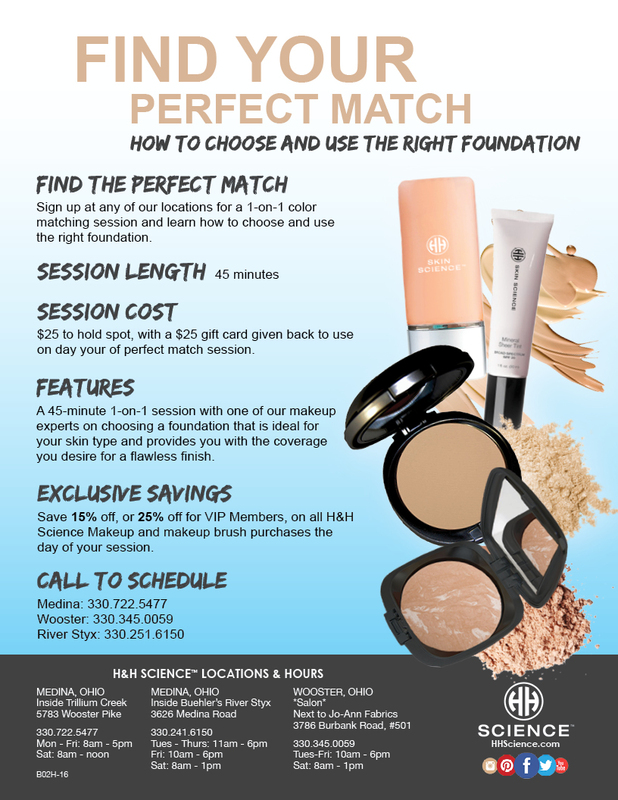 Join us for our “Find Your Perfect Match Foundation Class” and learn from our H&H Science Mineral Make-Up Experts on how to get your flawless finish. What Are the Benefits of a Teen Facial? Meet our Teen Brand Ambassadors!